St John's Cathedral | St John’s Cathedral is home to a community which seeks to bring the best of Anglican tradition into dialogue with the issues and needs of our day. 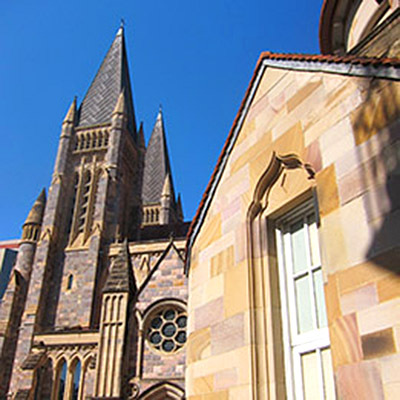 St John’s Cathedral is home to a community which seeks to bring the best of Anglican tradition into dialogue with the issues and needs of our day. We strive for open-minded conversation, seek to practice inclusion, and reflect on how we might see our beliefs put into action. We want this to be a place where people are encouraged to seek God and progress their own spiritual journeys. 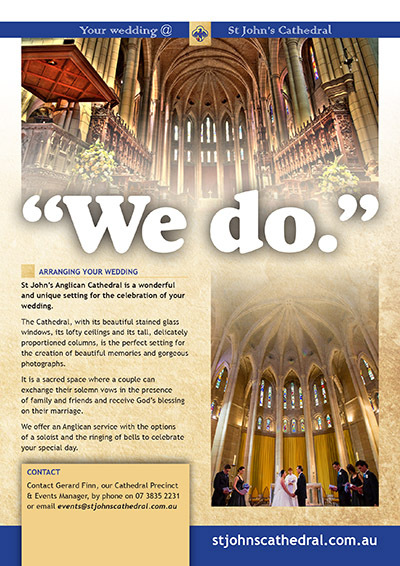 The Cathedral itself, a renowned Brisbane landmark, serves as a magnet, where diverse people gather to worship, celebrate, seek solace, converse and learn. Welcome to St John’s Cathedral. The news items below highlight topics of general interest. For details of special events and concerts at the Cathedral please see the WHAT’S ON page. You may find information about our regular worship times on the SERVICES page. Here you will find quick links to two weeks of Service Notes for each of our four Sunday services. These will be updated each Thursday – “THIS WEEK” covers the coming Sunday; “LAST WEEK” the preceding Sunday. Click the title bar or ‘+’ button to toggle open your chosen week and select the service time. During Lent each year, we support the annual Appeal of the Anglican Board of Mission (ABM) which undertakes a diverse range of projects around the world. With a vocation to share in God’s mission, the ABM seeks to follow Jesus by engaging as He did at the margins of human existence where the Holy Spirit calls to the Church. Our Lenten project for 2019 – The Aboriginal and Torres Strait Islander Mission Fund – supports missional activities led by Aboriginal and Torres Strait Islander people. With guidance from the National Aboriginal and Torres Strait Islander Anglican Council (NATSIAC), the ABM Fund makes small grants available to projects which are chosen by and will benefit Aboriginal and Torres Strait Islander people. The ABM believes that the voices emerging from the struggles of people marginalised in our own society help us to hear what the Spirit is saying to the church, and to prophetically imagine the future God is calling us into together. By supporting projects they have designed themselves, the Mission Funds empower First Nations people. Can we provide $1,000 towards supporting ABM to help the Aboriginal and Torres Strait Islander Anglican church through small grants allowing them to discern their own mission priorities? Following the fundraising Luncheon’s 25th anniversary event in 2018, it was determined that a new look, replacing the typographical wordblock in use for the past seven years, was called-for to open the event’s next quarter-century of “sharing our giving”. Our 2019 Luncheon beneficiary is Hummingbird House – Queensland’s only children’s hospice, providing short break stays, family support services, creative therapies, and care at the end of life. Hummingbird House is a place where kids can be kids, families can reconnect and precious memories can be created. MC for the 2019 Luncheon is ABC TV Queensland newsreader Matt Wordsworth. This Queensland Government map indicates the magnitude of the drought and clearly shows areas in our own Diocese, and beyond, which are suffering the most. 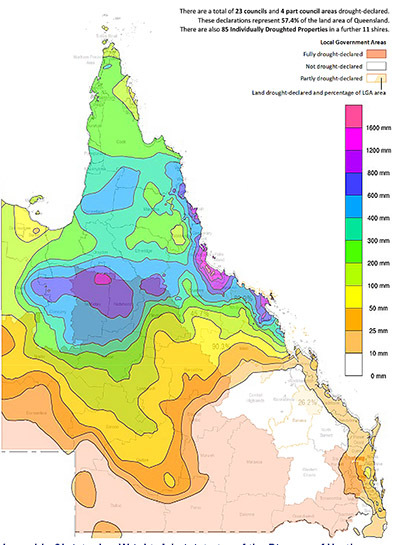 It has been overlaid with the BoM’s rainfall plot for the period 26th January to 7th February, showing the extent of the deluges which have added to the heartbreak across the North. Statistics alone do not reveal the hardship and strain placed on families living in drought-affected regions – and few would have been unmoved by the piteous sights of drowned, starved and frozen livestock in the floods which unexpectedly swathed much of northwestern Queensland. The challenge involved in enduring prolonged drought is considerable. The horror and despair at watching green shoots submerged in brown lakes can only be imagined. Faith in Christ and drawing on collective resources to overcome present difficulties helps enormously. 373 Ann Street, Brisbane, Qld, Australia. Open for visitors from 9:30am-4:30pm daily. © St John's Cathedral. All Rights Reserved.